Speaker | The Cool Lifestyle | We show you how anyone can afford a fun and fast car! If you are a member of a classic car club, a trade organization, or a business involved in any aspect of the collection, ownership, repair, and maintenance of classic automobiles, Robert P. Hall is available to speak on topics of interest and value to your group. 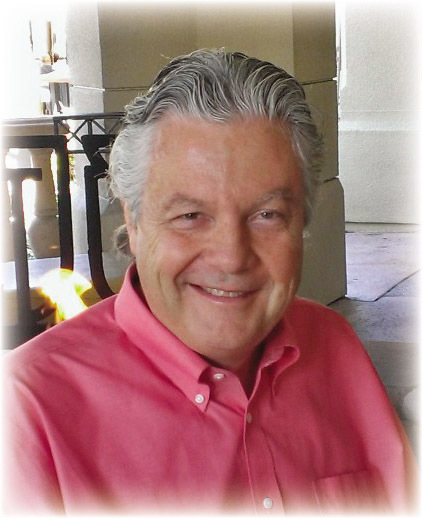 Bob has always had a strong passion for life and building connections with people. These connections often lead to lasting friendships, especially when they combine his twin joys: ensuring successful projects in the construction industry and owning and driving sports cars of character. Bob has worked as an attorney for more than 25 years, a profession that requires unusually skillful and direct communication with a wide spectrum of people. He started out handling construction claims on behalf of property owners; today his practice focuses on counseling clients who undertake renovation and repair projects. His many days of meeting clients on-site required even more time spent on the road, and he was quick to realize the importance of enjoying the drive and arriving on time and in style—behind the wheel of a cool car. Bob began collecting classic sports cars and using those beauties as part of his professional practice. 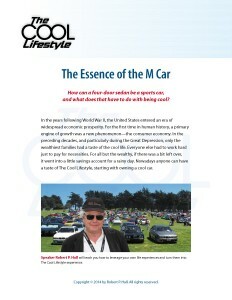 His quest for cool has led him to own several select marques over the years, including Porsche, BMW, and Ferrari. Porsche It began with a Porsche 911 Weissach limited edition. For more than 10 years, Bob was an active member of the Porsche Club of America’s Redwood Region, serving as breakfast-run leader, coordinator, and advertising director. He has participated in concourse events, national auto parades, regional tours, and racetrack corrals. 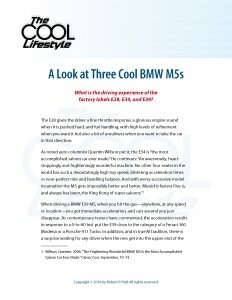 BMW As driving distances imposed by his legal career became longer and the luggage requirements greater, Bob joined a California-based BMW club and purchased a series of four-door BMW M5s. 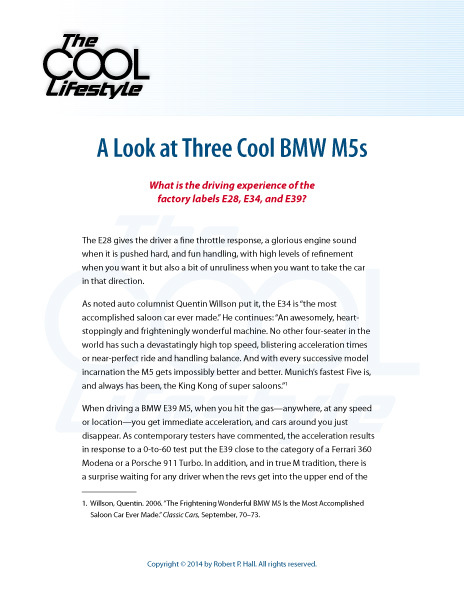 These are the cars that he lovingly describes in the first book of his planned series on The Cool Lifestyle: The Classic BMW 5-Series M Car: Open the Door to an Elevated Lifestyle. Ferrari Bob recently augmented his collection with a Ferrari F355 convertible known as the Spider. His memberships in various Ferrari clubs, both national and in the San Francisco Bay Area, have deepened his expertise of and enthusiasm for fine performance-oriented automobiles. Robert P. Hall would be delighted to share his knowledge and experience with your group in a custom-tailored presentation on The Cool Lifestyle experience, traveling from Northern California to anywhere in the western states. Additionally, Bob is a knowledgeable presenter on small-business growth, Internet marketing, traditional marketing, personal development, and work/life balance. For more than 30 years, he has spoken to trade organizations and industry groups catering to the interests of California homeowners. You can see more of Bob’s experience on his separate web site as a construction lawyer. Please click here to download the Speaker Intake Form.